Fighting wars you can't win is foolish, but no one has ever said that to ESPN's Max Kellerman, apparently. The "First Take" co-host, who infamously said in 2016 that New England Patriots quarterback Tom Brady was "going to fall off a cliff," refused to back down Monday morning after being proven wrong for what has to be the 10th time or so. Brady led the Patriots to their 11th Super Bowl appearance in franchise history -- the ninth for the 41-year-old quarterback -- with a thrilling 37-31 overtime win against the Kansas City Chiefs in Sunday's AFC Championship Game at Arrowhead Stadium. Brady led a go-ahead drive late in the fourth quarter and then won the AFC title in overtime with yet another clutch game-winning drive. It was a typical display of late-game brilliance from Brady. But, as Kellerman sees it, Brady was only "lucky" to leave Kansas City with a victory. Here's his explanation. Obviously, there's a lot of luck involved in every game, but there's no question Brady, despite not-so-great-looking statistics Sunday, was one of the main reasons why the Patriots punched their ticket to Super Bowl LIII. The Patriots hear Kellerman's criticism -- linebacker Kyle Van Noy even said last week the ESPN analyst should "stick to his boxing" -- and there's little doubt they'll use Monday's rant as extra motivation in preparation for a championship showdown against a very talented Los Angeles Rams squad. Dwayne 'The Rock' Johnson's comment on Tom Brady's shirtless NFL Draft photo is perfect originally appeared on nbcsportsboston.com When Tom Brady resurfaced his iconic shirtless NFL Draft photo on Tuesday, he basically was asking to get roasted. 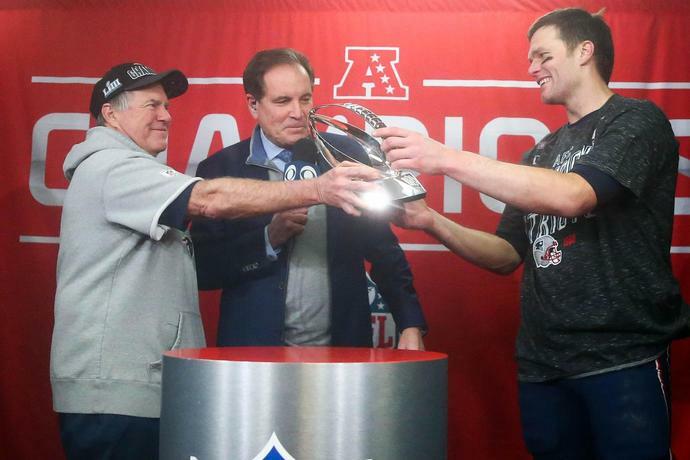 Pats roll the dice on WR Thomas Brady's teammates couldn't help but poke fun at the quarterback, who posted the photo on the 19th anniversary of the day the Patriots drafted him with the No. overall pick.